Children who attend Rugrats Traditional Home Child Care will feel included and loved by the providers and the childcare family. It is out goal to meet the emotional and physical basic needs of each individual child by providing a safe, secure environment, healthy meals and snacks, and a warm and caring atmosphere. Children who are cared for at Rugrats will receive support for their individuality to encourage a high self-esteem and will feel they contribute to and are part of a loving family. We want all the children in our care to feel as if their childcare is an extension of their home and each day they will feel safe and loved while they play and learn. Providers are here to encourage, guide, intervene, teach, comfort, support and most of all care for each child in a positive manner. 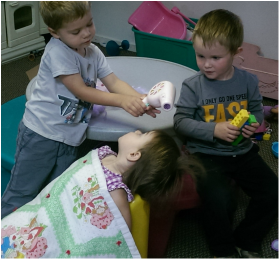 Play is a child’s work, and here at Rugrats we promote free-play for all children. We believe that free, child-directed play provides the best building blocks for more advanced learning later on in each child’s life. This style of care is fundamental in giving children the ability to learn and grow in the most natural situation. Children benefit with healthy pro-social behavior by the encouragement of mixed-age play. We provide all children with an enriching environment and large time blocks of uninterrupted free play where they can develop their own style of learning to its fullest. The children follow a routine for eating, napping, creative activities, and outdoor time, but in all play, we are very proud to say, the environment is child directed. This uninterrupted freedom gives the most valuable time and opportunity for children to learn new skills, through the unlimited use their own imaginations, to think for themselves, to create their own environments through pretend and dramatic play, and to develop their own unique personalities through their own play experiences. Free Play All Day? Can They Learn Anything That Way? Free play not only stimulates brain development in children, it also helps children to use their bodies in an active play state. During active free play, children are physically engaged in many ways to create, build and make use of the play environment around them. This will help develop good bone density, discourages childhood obesity and gives each child much needed daily physical activity whether they are indoors or out. Free play provides for child directed, open ended games and imagination stimulation. Children use hand/eye coordination through the manipulation of toys and play equipment, use new verbal skills to direct and teach, learn cooperation within a group, and to use more advanced communication skills while at play. 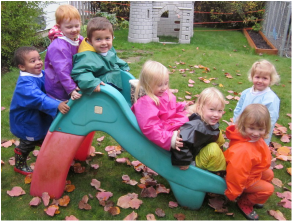 Dramatic play is encouraged and children will cooperate in their own learning through the many free play experiences within the group. The brain can only thrive with this type of input and children who are allowed the freedom to imagine and play games and activities that they have created within their environment will thrive as well. They are less stressed and more secure with the world around them. They enjoy daycare, get along better with others and are happier in general. Just some of the many benefits children can experience from free play. 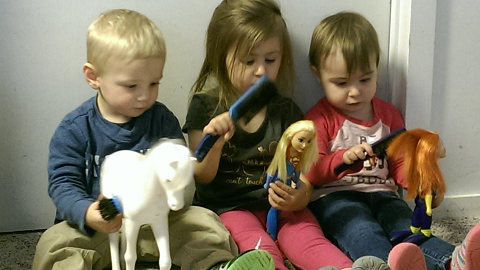 Children learn the basics of preschool academics from the free play environment in a healthier, child directed way. Early math concepts with color and shape recognition, preschool counting skills, sorting and categorizing, early language usage and literacy skills by verbal communication are all part of the many learning opportunities in the normal activities of a healthy free-play childcare environment. Toddlers and preschoolers do not need to be taught basic early learning fundamentals and will be exposed to counting, shapes, colors and letter recognition as they play. Children learn academics in a relaxed atmosphere with each child as a student, as well as a teacher within the free play childcare setting daily and experts agree that this relaxed early learning will be the most beneficial in promoting success in later academic experiences. The mixed-age, free play environment has been shown to provide the most natural social learning backdrop for all children in care. Learning in this way is critical in helping each child to become socially skilled with others who are at different developmental levels and ages. It also will help them to develop empathy, patience, understanding and acceptance of their friends and the differences between themselves and others. Younger children will be exposed to advanced language skills, social play dynamics as well as advanced academic knowledge. Older children will learn to practice cooperation, and learn how to be giving in childcare, to be responsible for their own social behavior and learn how it can affect other children in positive as well as negative ways. They will also learn to help younger children with caring consideration and be encouraged to show acts of kindness to others.